Recco Home Care Service, Inc., a New York State Licensed Home Care Agency, is a leader in the home health care industry, servicing families in Nassau, Suffolk, Queens, Brooklyn, Bronx, New York City and Westchester Country for over 45 years. Established in 1970, Recco Home Care Service is fully accredited by The Joint Commission and licensed under the stringent guidelines set forth by the New York State Department of Health. Our team of highly trained caregivers and professionals are available seven days a week, 24 hours a day to deliver compassionate, care to loved ones and their families. 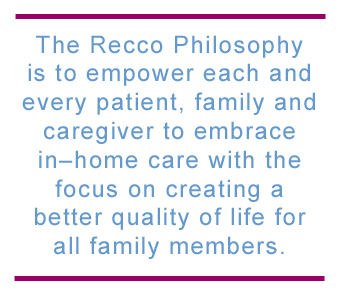 Recco Home Care Service is committed to the continuous advancement and training of all staff – from home health aides to hospice care experts. We are diligent in our pre-screening procedures and all caregivers must pass a rigid application and interview process. We pride ourselves on providing the ideal match for all families in need; our staff of home health aides, caregivers, registered nurses and administrative staff are trained specialists in the areas of senior care, alzheimer’s/dementia, physical and mental challenges and the needs associated with long-term convalescence and care. Many of our staff are bilingual to accommodate the growing need for diversity in the home health care industry. The Health Care Industry is growing and changing rapidly. We are committed to staying abreast of all changes and innovations and provide in-house, comprehensive certification and training for all staff. Our in-service courses provide a better education and understanding of client’s needs and our commitment to excellence goes beyond clinical knowledge. Our in-service courses include both clinical and psychological seminars in all areas of care from skills and procedures to compassion training and family dynamics. Recco Home Care Service is an approved training center throughout the New York State Department of Health and called upon frequently as a model for other State agencies.